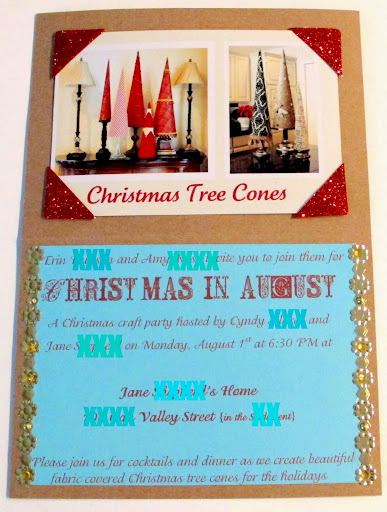 My neighbor “Crafty Jane” and I recently hosted a “Christmas in August” Christmas craft party at Jane’s home. Jane and I donated a “Girl’s Night Out” craft party for 12 for a school fundraiser/silent auction. Included in the party was invitations, dinner, cocktails and all of the materials to make the craft. 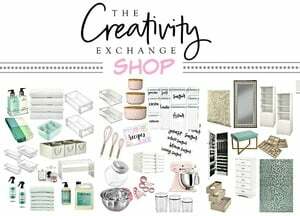 What more does a crafty girl need? 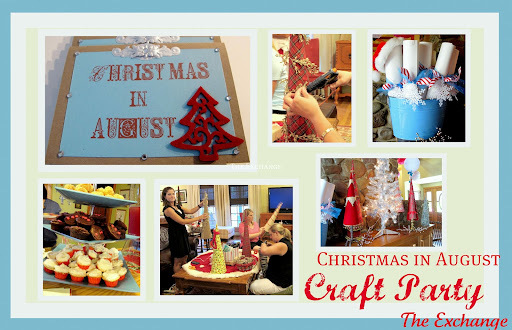 Since the ladies wanted a Christmas craft, we decided to call the craft party “Christmas in August” and tie in Christmas elements mixed with summer in our decor, food and invitations. We started with the invitations that Jane and I made from papers and embellishments found in the dangerous scrapbook aisle at Hobby Lobby. Jane and I found these great basic note cards and envelopes at Hobby Lobby that were 50 (note cards and envelopes) for $9.99!! We printed out our wording onto paper and cut and used double-sided scrapbook tape on the pre-made note cards. We blinged out the invitations with all kinds of fun embellishments found in the scrapbook aisle. We picked our main colors of turquoise for summer, and the red for Christmas. I also put out all of my Christmas tree cones from last year so the ladies could see what the cones look like finished and blinged out. Station #3 was out in the garage and was for spraying the adhesive to the poster board cones and attaching the fabric. For some reason I did not get a pic of station #3, sorry! For dinner, Jane’s mother made an amazing cold pasta summer salad and a pork loin that had been marinated with pecans and cranberries. Glenda also made an incredible assortment of mini cupcakes, brownie bites and cheesecake balls!! And of course, the ladies need a yummy special cocktail which was a cranberry/ pomegranate margarita! By the end of the evening, Jane and I were AMAZED by all of the gorgeous blinged out tree cones! 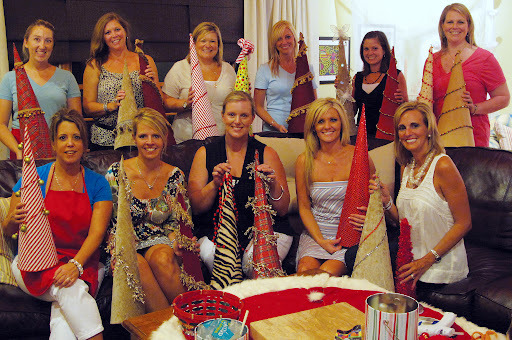 These ladies really went all out and they were such a fun group to craft with! Everything went so well for our first craft party and the ladies looked like they were having a great time! From an expensive standpoint, the party was not that expensive. Jane and I used our left over stashes of fabric and trim and purchased poster boards 3 for $1.00. We made our own invitations and used our own Christmas decor to decorate. Food and drink were probably the largest expenses but still not terribly much. Overall, this is a party I will definately be doing again! A BIG THANK YOU to Erin and Amy for purchasing the party for our kid’s school! I hope you all have a wonderful week and thank you so much for your comments, emails and notes! I love hearing your feedback! That looks like fun! 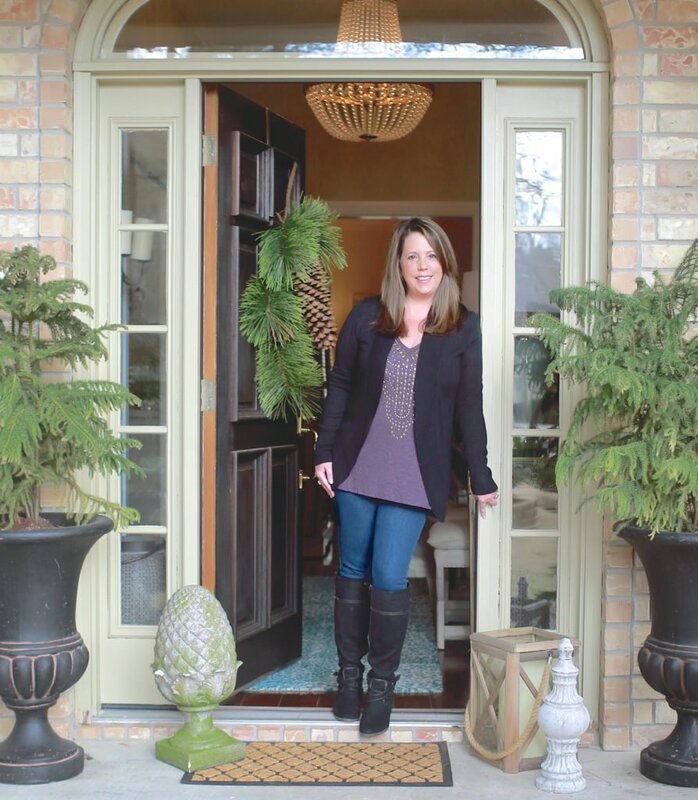 I was just thinking about starting up a similar party this month…great inspiration. Thanks! Oh yeah love the Christmas/summer decor! I would so do that! Oh my!!! How much fun is this!!! I must do this next year (school's started and the busy life begins yet again)! I found you through Pinterest with this project, I love it, so elegant, easy and festive! Thanks ladies! It really was fun! I can't wait to do another one, it was a lot easier than I thought. this is such a good idea. i'm from the pineywoods as well. nice to meet a fellow blogger from my region. What a wonderful party!! I will have to try to make those trees!! I love the round tray with the leopard on it! I'll have to keep my eye out for one! such a fun idea! And a jump start on christmas decor!! I just had a Christmas in August get together too – but I would have rather gone to yours. I like the idea of one project. Love the trees. Saw you on the Sunday Showcase. I LOVE this idea! I'd love to do this as a fundraiser for a maternity home I help out with. Thanks for such great inspiration. I soooo love this idea. I am going to try and make some of these for me. Love it!!!!!! Thanks for sharing. If I can do this I may have a Christmas craft day for me and my friends. They would love this. Heck, we would just love getting together for a change. This would just be an excuse. What a great idea! My air conditioning doesn't work well enough for anyone to even pretend it will ever be Christmas. Maybe I could plan one of these for September! Thanks for the idea! You are one party decorator. Your place looks very colorful and all the stuffs within it. You inspire me! WOW! Any chance of getting a post with the recipe for that cold pasta dish? Looks amazing!! 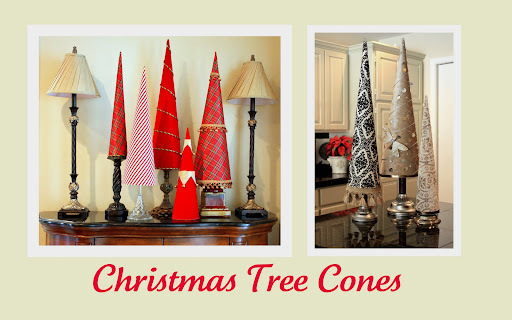 How much material do you need for each size cone in your Christmas in August idea? Also, may I have the recipe for the pork loin with marinated cranberries and pecans and the cheesecake balls?